Happy Friday to you all! We hope you’ve had a great week! Today is Friday, so we want to once again share with you one of our favorite websites: The Source for Youth Ministry. The Source has incredible resources and information that has been compiled by Jonathan McKee. 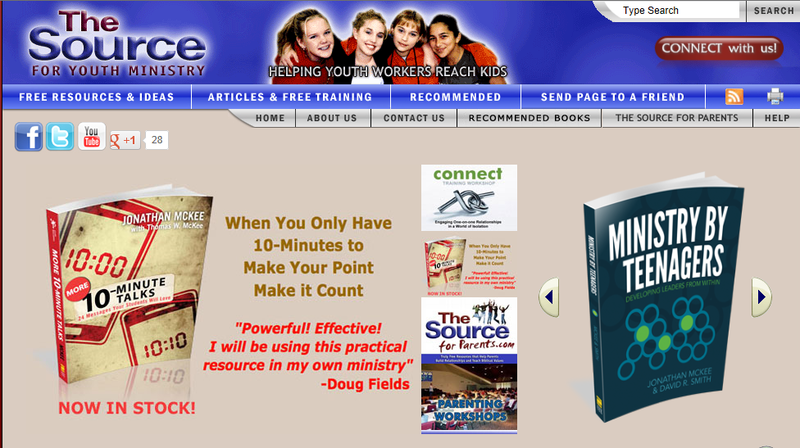 He started another website in 1999 and found out that there were a ton of youth workers around the world that were craving a site like this. While many sites have launched since, The Source remains one of the elite, providing materials that are relevant and up to date. I could write a book about all the things provided on The Source for Youth Ministry, but I want to focus on just one facet today- their games. If you are looking for sheer volume, almost no site can top The Source. They literally have thousands of games available. That might seem overwhelming, but the great part is that they have broken them out into categories so that you can quickly narrow down your search. For instance, you can specify your groups size, items needed, prep time, type of game and game locale. By narrowing down the parameters, you will quickly have a handful of games at your finger tips. On the other hand, if you are a game nerd like me, you can sit and read through every single game they have for hours upon hours! If you’ve never been on The Source for Youth Ministry site you are missing out. Stop by their site to grab a ton of great (and many free!) resources. You can follow Jonathan on twitter @InJonathansHead and subscribe to his blog. Jonathan McKee, president of The Source for Youth Ministry, is the author of numerous books including the new Candid Confessions of an Imperfect Parent, and youth ministry books like Ministry By Teenagers, Connect: Real Relationships in a World of Isolation, and the award winning book Do They Run When They See You Coming? Jonathan speaks and trains at conferences, churches and events across North America, all while providing free resources for youth workers and parents on his websites, TheSource4YM.com and TheSource4Parents.com. Jonathan and his wife Lori, and their three teenagers Alec, Alyssa and Ashley live in California. To get more great resources and games, subscribe to our blog and follow us on Twitter @stumingames.